Top Five Forearm Exercises For Mass Gain! Do you want to build thick, vascular forearms? Then include these great Forearm Exercises for Mass in your routine. To ensure the best overall development, you need to train both Flexors and Extensors. It’s also worth considering some Static Holds. The wrist roller is an implement with two handles, a cord and a weight attached. The twisting motion allows you to work your Flexors as you wind it up, and Extensors as you lower it under control. 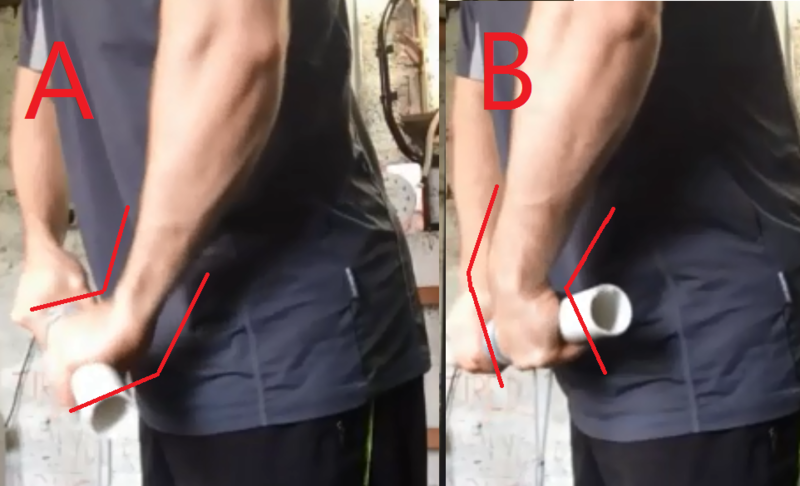 Quick Tip: Hold the wrist roller down at your waist. If you hold it out in front of you then it will likely fatigue your shoulders before really working the forearms to their capacity. Note how as I grab with my left hand (A), the back of my hand is pulled up towards my forearm. This is wrist extension. By twisting the handle towards me it moves my wrist into flexion (B), working my wrist flexors. To change direction, I would grab the pipe in position B, and under control twist the pipe to position A. This would work my extensors on the top of my forearm. Sets and Reps – I recommend 3-5 sets of 15-30 reps, making sure to go both directions. A Farmers Walk involves holding a weight in each hand and walking for as long as you can before your grip gives way. If you don’t have space to walk, you can simply hold the weight while standing (or seated for a safer release). If you can only hold the weight for 15 seconds or less, you are effectively working your grip strength more than forearm size. Aim for 30-60 seconds per hold and really squeeze the handle to improve the size of your arms. Here you can see i’ve opted for a Seated Dumbbell Hold (one in each hand). If you do this, make sure you have a solid upright posture. For better forearm activation, increase the size of the dumbbell handle with Fat Gripz or a home-made alternative like pipe insulation. 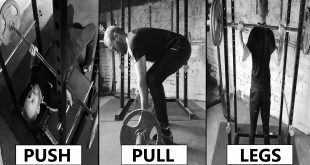 A great tool for Farmers Walks or Static Holds is the “Trap” or “Hex” bar. 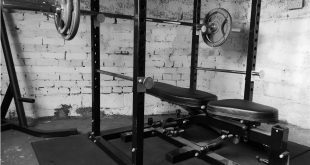 Sets and Reps – I recommend 3-5 sets of 30-60 seconds. If you can hold it for over 60 seconds, then you need to use a heavier weight. These are the first forearm exercises that come to mind when looking to improve arm size. Similar to the movements of the wrist roller, they can be broken down into Flexion and Extension work. Sit down on a flat bench. Place the back of your forearms on the bench, allowing your wrists to come off the end of the bench. Choose a suitable weight. Being able to take it slowly through a full range of motion is more important than maximal load. You can use either dumbbells or a barbell here. Grasp the bar firmly, with wrists in the extended position. Keeping the forearms together, bring the wrists up slowly into flexion. Pause briefly at the top, ensuring you feel the contraction, and return the weight slowly. A similar set up to the Flexion, except the underside of your forearms will be placed on the bench. This is a tougher exercise, so you will need to start with a lighter weight than the last exercise. Starting with flexed wrists, bring the weight slowly up into wrist extension, feeling the contraction at the top before lowering under control. If you develop any wrist pain, switch to dumbbells and allow the knuckle of your index fingers to be angled higher than the knuckle of your little finger. Sets and reps – These exercises are best done back-to-back, or in supersets. I recommend 4 sets of 12-15 reps for each movement. Another way to target the forearms is with a crushing movement. 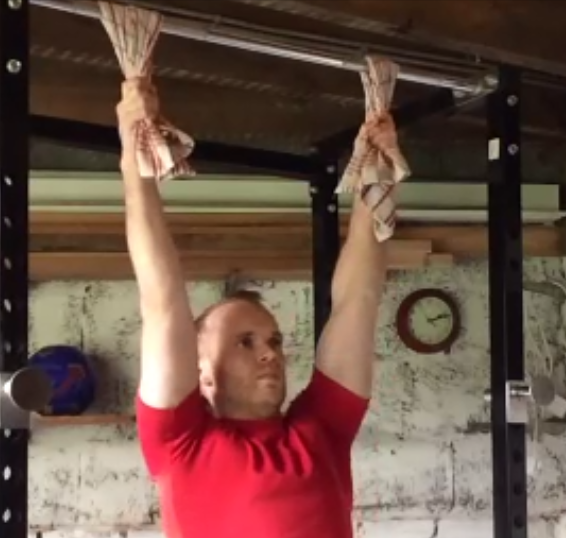 Placing hand towels over a pull up bar will mimic the difficulty of holding onto a rope, with more emphasis on squeezing with the hand. For the Hang – You will need to remain “active” during the hang, so don’t relax completely through your shoulders. Depending on your strength levels, you may find this too advanced. If not, hold for 30-60 seconds for several sets at the end of your workout. For the Towel Wring – Find a thick towel at home and soak it in the bathroom sink or bathtub. Now spend 60 seconds squeezing and wringing the towel with full force (video is lower intensity demo). The gripping and twisting motion hits both the forearm flexors and extensors in the same exercise. This is a great exercise when you don’t have access to a gym, and can be repeated 2-3 times, with several minutes rest between each attempt. It’s possible to change your current exercises to increase the emphasis on forearm development. While regular curls involve supinating the hand (palms towards you), by pronating the hand (palms away) you can hit the forearm extensors. Selecting either a Barbell, Dumbbells, or EZ Curl Bar (video), keep the elbows in tight to the body and complete your curls. The emphasis should be on the middle range of the movement – you don’t need to drop the arms to full extension or bring the weight right up to your chin. Using a neutral grip (palms facing each other) targets the forearms in a slightly different manner. Using a pair of dumbbells, tuck those elbows into the side and use slow, steady reps. Tip: Shift your grip off-centre so that your little fingers are pressed into the inside of the dumbbell for added stimulation. 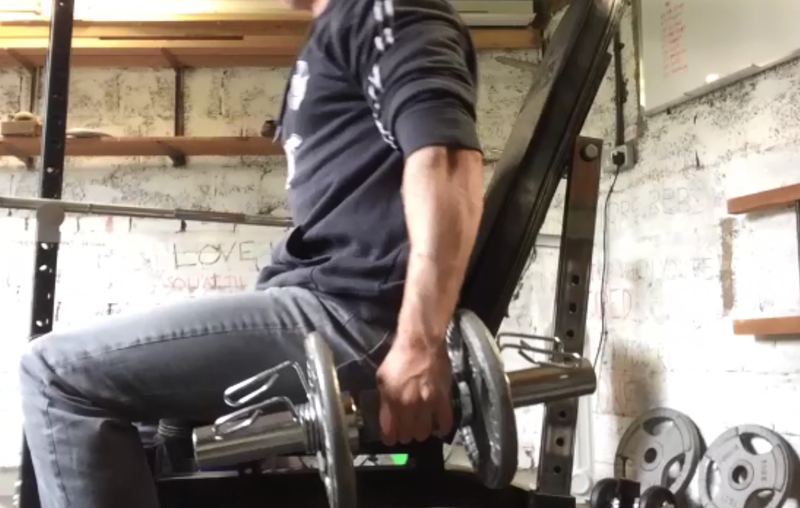 One restriction with the reverse curl is that while the benefits come mainly from lowering the weight, fatigue occurs when you are unable to raise the weight. By curling with a supinated grip you can handle a heavier weight, thereby overloading the forearms when you pronate the wrists and lower the weight. 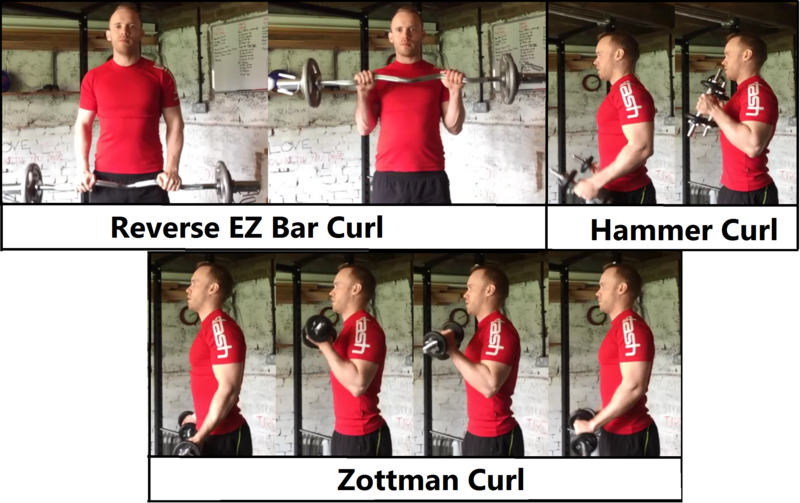 Sets and Reps – Add in one or two of these curl variations to your routine and aim for 3-4 sets of 8-12 reps. Thanks for reading, I hope you are able to include these Forearm Exercises as part of your training! 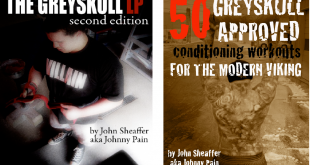 Please SHARE this content with your training partners and fellow strength athletes.